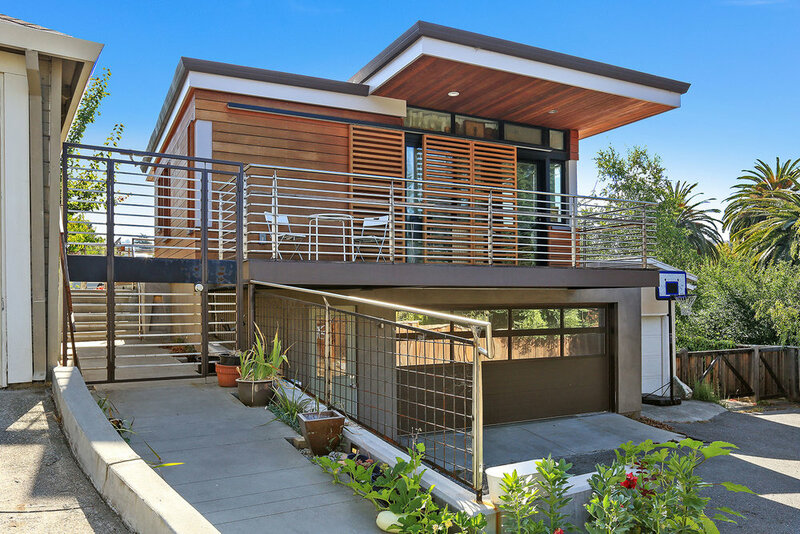 WARE provided the architectural and structural design services for this single-family Tiburon home featuring fire resistive and non-combustible framing construction throughout. 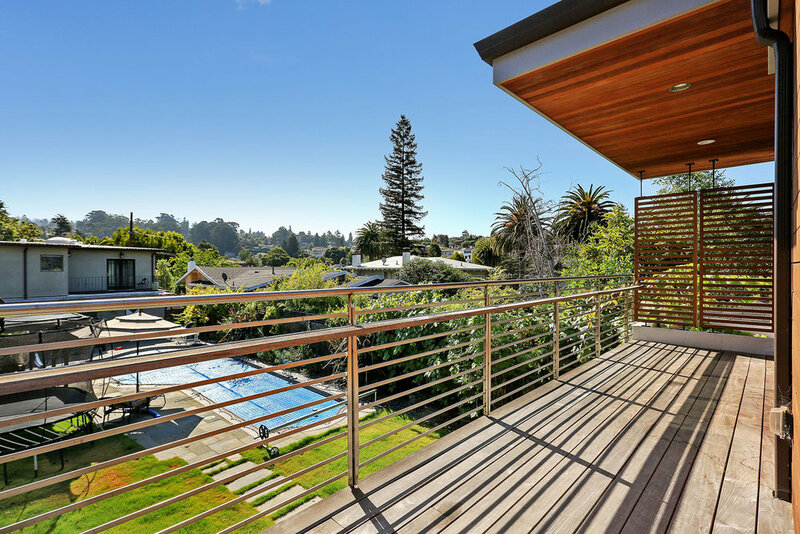 Designed to take advantage of the expansive views of San Francisco, the Golden Gate Bridge, and southern Marin, the home is characterized by full-story operable glass facades. Fretted glass awnings help reduce solar gain on the southern exposure. The roof design includes photovoltaic panels and a green roof with drought-tolerant plants. The home’s performance-based design features non-combustible materials such as concrete walls, steel and metal stud framing, and cement-board sheathing to help reduce fire and life safety risks. 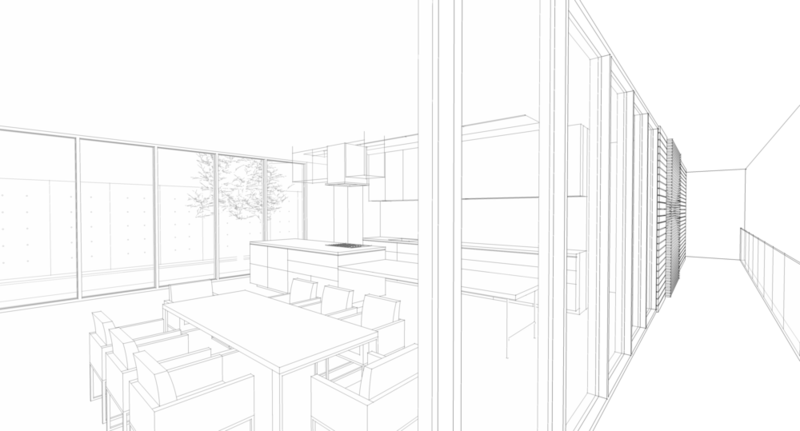 WARE provided architectural and structural design services for this Piedmont remodel. 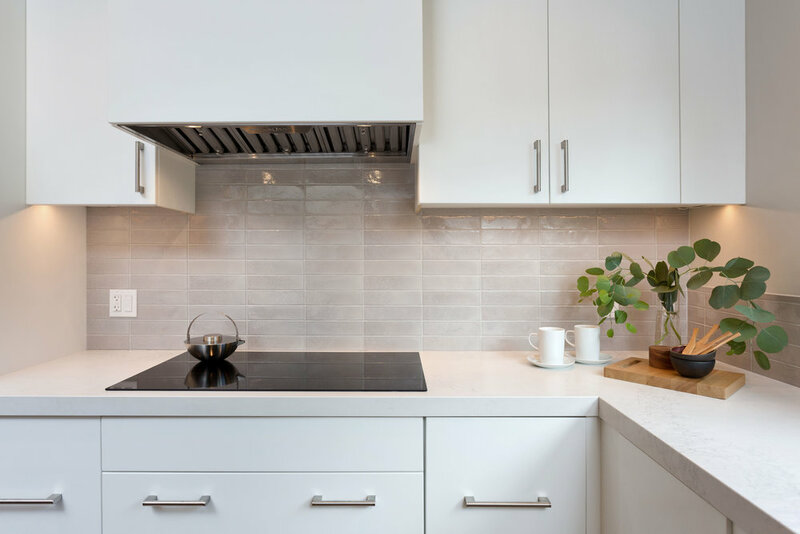 Skylights in the kitchen maximize natural light, while three and a half bathrooms were updated to meet the contemporary design criteria while fulfilling diverse user demographic requirements. ADA compliance and child safety standards were considered throughout. 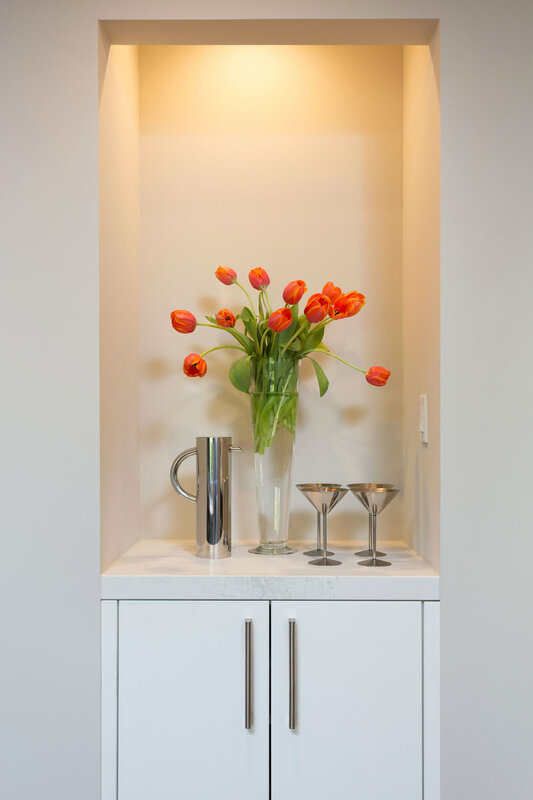 The midcentury modern house, beautifully located near the Belvedere Lagoon, was updated to meet contemporary standards and the needs of the new owners. A large patio is now the central focal point and relaxation space. The wide glass door between the living room and the patio creates a seamless transition between inside and outside. A new entry gives the house an elegant face looking onto the street. This DIY house best fits a typology of flexible, urban, residential infill. Located on a lot zoned for two dwelling units, the initial concept for the project was a wood framed studio for two people to live comfortably and eventually build out the lot density with two single-family homes. Designed to be built exclusively by the owner, who had no construction experience and a budget of $150,000, this single-story wood-framed residential studio in Berkeley combines sustainable building practices with an elegant, expandable design. All components – electrical, framing, plumbing, holdowns, and foundation – were designed and installed to support a second floor addition. To that end, a hole with temporary joists spans the future stair cavity. The reusable metal shed roof uses ceiling joists that can, at a future time, support the weight of a second story. Natural materials, passive solar heating, high energy efficiency, natural lighting, and cabinetry level construction define the space of this urban residence. Our client was a young family who wanted to convert their existing garage and attached in-law unit for their grandparents. The complete addition encompasses a studio with kitchen, storage space, and balconies. The unit has access to the backyard and pool. Wooden screens are added for privacy. 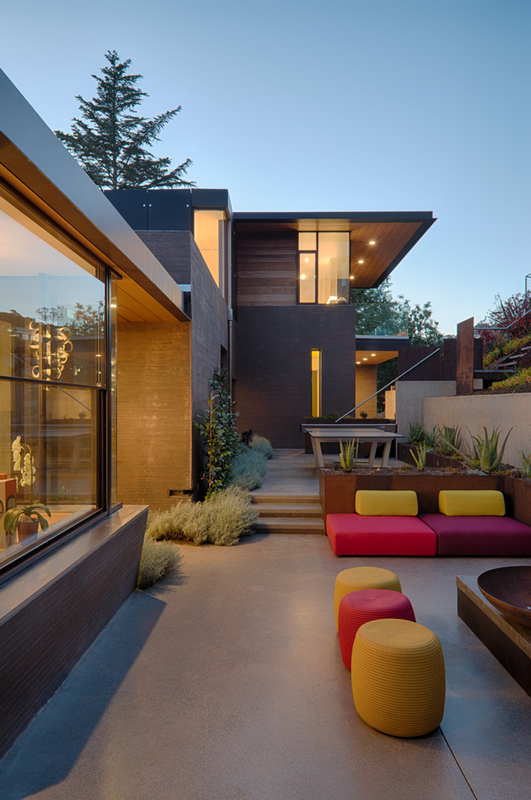 This two-story residence is designed for an undeveloped sloped lot in Piedmont, CA. The owners requested a four bedroom, 2.5 bathroom house with a living room, dining room, kitchen, mechanical room, three car garage, entry foyer, study, and laundry room. The house is nestled within the existing oak trees on the site. 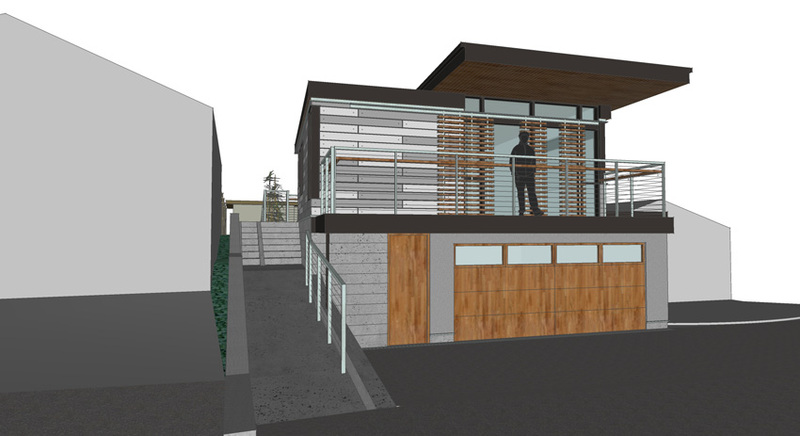 This is a new approximately 6300 SF single-family house with a 1650 SF basement and a 640 SF existing garage and 960 SF guest studio, on a flat lot. The main level of the house consists of the living room, dining room, pantry, office, yoga space, half bathroom and a separate guest studio. The bedroom wing contains the master bedroom suite, three bedrooms with bathrooms and the kitchen. The lower basement level includes the recreation room and mechanical room. The house has an intimate connection with the site to maximize the relationship between the indoor and outdoor spaces. Our clients, a cinematographer and a developer/builder, began with an ideal creekside property in Mill Valley. On the site was an unusual concrete masonry unit (CMU) building that was seismically unsafe and inadequately sized for their family. The existing living spaces were uncomfortably confining, with low ceilings and inadequate natural lighting. The clients envisioned a sun-filled home with panoramic views of Mount Tamalpais. The design includes a new master bedroom suite, an office, a deck with an outdoor fireplace and a living room that opens to both the kitchen and a garden and visually captures the sky and mountains. Rather than completely demolish the existing CMU structure, and unable to find a cost-effective seismic upgrade for the entire building, the design integrates a unique building-over-building concept. The initial step was to remove the long-spanning and hazardous reinforced CMU roof, allowing steel frames to spring above the shell, supporting the new addition independently above the existing CMU box. This raised the living room ceiling height with perimeter clerestories, which allowed light to pour into the interstitial space between existing and new construction. The steel frames provide seismic bracing for the existing first floor CMU walls and an armature for the more delicate wood and glass second floor addition. 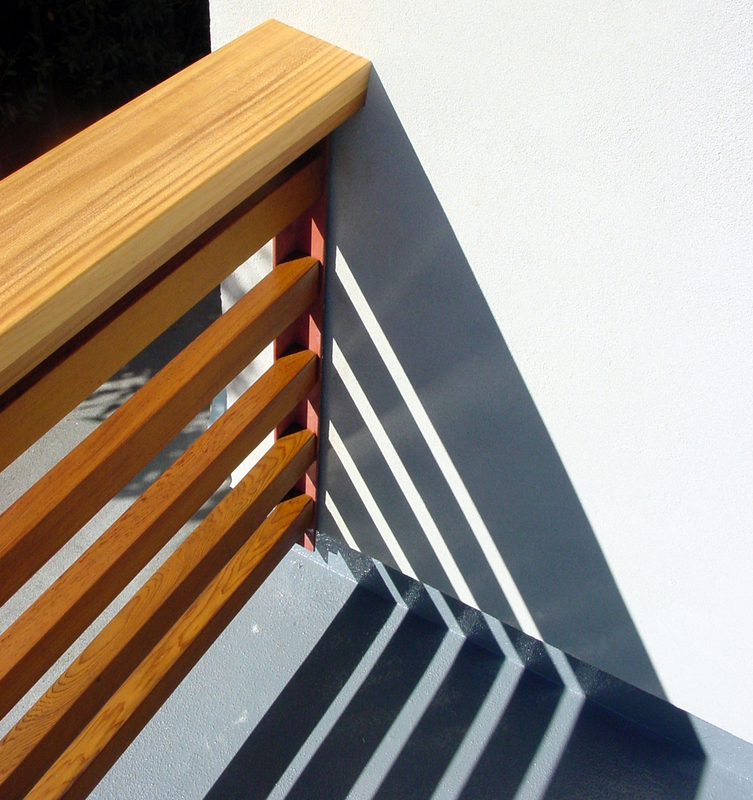 The steel frame expressed itself in many details of the project, including the glu-lam stair treads. They appear to float, cantilevering from one of the seismic steel braces set flush with the wall. Above this staircase, stainless steel tension rods define the extent of the lightwell, allowing views from the office to the mountains beyond. Set against a mahogany ceiling, the tee-shaped steel purlins project through the clerestories, forming the handrail and deck above. The disparate natures of the existing CMU and the new steel structure were unified by the sensitive and consistent use of wood detailing seen in the cedar eaves and siding, the built-in cabinetry and tinted cement radiant-heated floors with inlay. Known for his light-and-space-based art, James Turrell’s vision for this Napa Valley residential poolside dining and lounge space was to float a minimalist plane, designed with a center cutout that opens to the sky, 14 feet in the air using nearly invisible support. Looking up through the square opening alters viewers’ perception of light and space, making them acutely aware of hyper-real clouds and a constantly changing sky. To achieve the artist’s vision, Endres Ware collaborated with Turrell and architect Jim Jennings to create a 40-foot by 50-foot plane with an 8x8 square oculus at its center. The razor-thin edges were detailed to a 1/8 inch thickness for both the oculus and exterior edges, enhancing the ethereal lightness of the plane. Four thin steel support columns, two with a 2.5 inch diameter, two with a 5 inch diameter, hold the plane in the air and restrain its seismic forces. Between the four columns span rectangular hollow sections, allowing tapered cantilevered trusses to minimize its edges. The columns were spaced to minimize deflection in both its cantilever and interior span. Adjacent to the Skyplane’s viewing space is an infinity pool with black walls and bottom. In the pool, a second Turrell work, a Skyspace, floats, allowing an alternative viewing of the framed sky, and is accessible by swimming underneath the walls and popping up into an enclosed reflective world of light and space.